Though born in Hickory, NC, the twists and turns along life's highway paved the way for Cheryl Getzinger to finally make her home in Hope, Michigan. Having learned to drive a semi-truck during her first marriage, Cheryl cruised the highways with her son sometimes in tow. After meeting her current husband, she settled down in Hope. Cheryl still drives a semi-truck delivering lumber, block, concrete and building materials. But now she's got another ambition driving her along; the desire to make teddy bears. 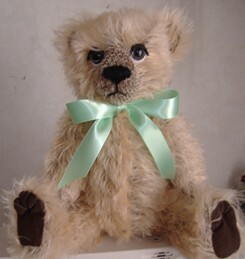 "I began making bears 9 years ago when our niece was born, as a gift to her. That was the beginning of a lifelong love of bear creation. It's very addicting." Cheryl made her first bear from a Simplicity pattern. "I did not like the way it turned out. Then the alterations began. I would see a style of bear online and buy a pattern, then alter it." After none of the patterns she purchased were really what she wanted, she soon began drawing her own. "Now I have my own style." After a lot of trial and error, she finally got the look she was looking for. Developing her style further, she read books by bear artist/author, Nancy Tillberg and took online classes that Nancy offered. "I followed her advice to achieve soft sculpting techniques such as noses and open mouths." Usually making between 5 and 10 bears a year, with more around Christmas time, Cheryl puts the greatest amount of attention towards the bears eyes. "After all, they are the bear's window to their world. I try to get as much expression and love into those eyes as I can possibly get," she said. "When the eyes are just right, I know then I can stop. 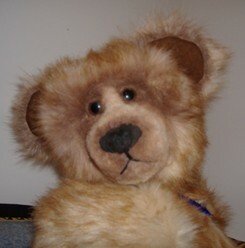 I work hard on the eyes of my bears, felting the eyelids, shading them and lately I have been adding mohair eyelashes." Originally working with synthetics, Cheryl has now started working with mohair. "I love working with mohair. It doesn't make me sneeze like the synthetics!" Making the bears solely by herself, she finds that creating bears is her way of relaxing and de-stressing. "Once I start making one, I am in my own world and I seem to tune out all the world around me." Of course, it's hard to stop working on a bear once she starts because she can't wait to see what the face will be like. 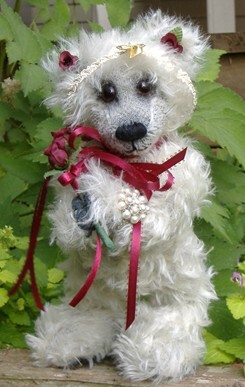 Investigating new styles, she has made bears with felted faces, felted muzzles, felted paws, and pulled toes. She also has tried air brushing the faces and using dye pens for accents around the eyes. Sometimes it takes her four or five times to get the nose just right, so making a bear is not just a quick sew together and then it's done. "If I don't like what I see, no one else will see it until I like it first." "Each bear is a work of art, one of a kind, even though the pattern may be similar, the bear is completely different." 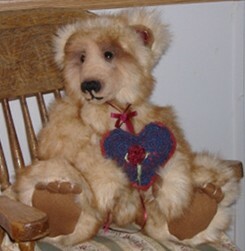 Cheryl sells her bears mainly online at auction sites, but also has her own web site. "I have sold a few custom made bears via word of mouth." And of course, she's given away many bears for gifts. "What I love most about the teddy bear industry is that it is full of wonderful artists who show the warmth in their hearts through the eyes of their bears." And even though Cheryl spends much of her time on the road as a self proclaimed "bear making/truck driving grandma", she knows that no matter how far you travel, you'll always have a hug waiting for you in the arms of your teddy bear.